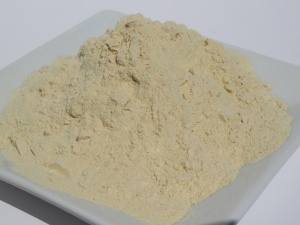 Onion powder is dehydrated, ground onion that is commonly used as a seasoning. It often features as an ingredient in seasoned salt and spice mixes, such as beau monde seasoning. Strong and fresh - it's a quick and easy way to bring real flavour to your cooking. Energy 40kCal, protein 1.10g, fat 0.10g, carbohydrates 9.34g, dietary fibre 1.7g. Minerals: Calcium, iron, copper, magnesium, manganese, phosphorus, zinc. Vitamins: A C, E, folates, niacin, pyridoxine, riboflavin, thiamin, pantothenic acid.